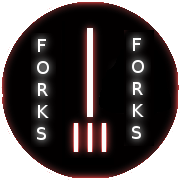 These badges are used by authorised members of the Friends Of Really Kool Sobriquets (or FoRKS) to denote whether a trope name suggestion is sufficently cool. 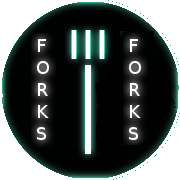 If it is, use the green badge (the one with the fork pointing up, in case you're colorblind). But if not, use the red badge (fork pointing down) to denote that the above Trope name suggestion is Insufficiently Kool, and that while it may be clear and concise, or even the "professional" term, it lacks the punch, pizazz, and/or zing to justify itself. We just came out of the shadows, so this page won't come into its own for a while. Contrast with Society to Prevent Overly Original Names (AKA SPOON), SPOON Stamp.